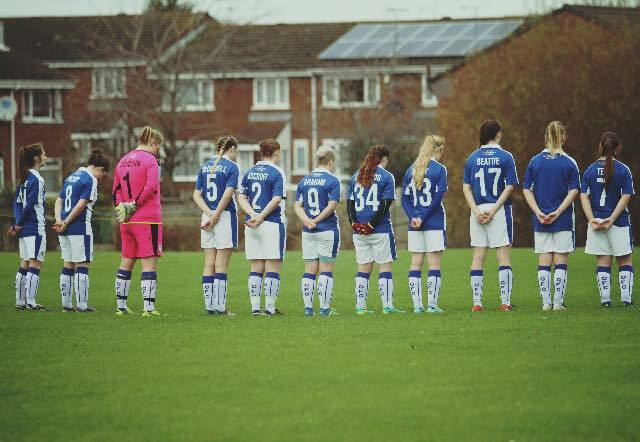 We entertained Runcorn Linnets Ladies at home in a repeat of our opening league fixture. We knew what a good team they are from last season’s league and cup double and from a difficult opening fixture. Having looked at their results they have been a bit up and down this season but we knew they would be up for the game against ourselves. We are the team currently top of the league and if we carry on winning we know we will stay there. The focus for this game was all about ourselves, to defend from the front giving Runcorn no time and to keep possession of the ball. The focus being if we have possession we cannot be hurt. Anybody who has seen us play this season knows we like to keep the ball on the floor and play rather than always being direct. We are the leagues top scorers and this is all because of the type of football the players are producing week in, week out. The game started slowly and our concentration was on not doing anything needless and conceding early like we did in the away fixture. We seemed cagey and did give the ball away on a number of occasions, we looked slow and there was a lack of movement especially from our own free kicks and throw ins. Despite the slow start Runcorn did not really create anything of note. With our first proper move of the game on 17 minutes, a great bit of combination play in midfield resulted in the ball being played out wide to Becky Tebb on the right who beat the left back before hanging the ball up superbly to the back post where the onrushing Amy Whittle was pushed to the ground with both hands by the Runcorn full back. The referee did not give a penalty but a video of the incident shows the player making no attempt to play the ball and Runcorn came away very lucky. One area we targeted in the build up to this game was Runcorn’s vulnerability from corners as seen in our last 2 games against them. We have a lot of height in our team and some great headerers of the ball and we wanted to take advantage of this. We did have a number of corners in the first half but failed to make any of them count, it seemed as though Runcorn had been working on this. We also over committed at one corner and Runcorn countered very quickly and almost made us pay with Tempany Carlson failing to test Charlotte Dunbebin when she really should have scored. It was a lack of concentration and a big let off. We did not really create to much more other than a good Lauren Stringer chance on 39 mins putting an effort wide after making a good run into the box from an unusual position on the left. At half time we talked about being better on the ball and not to force passes that were not there to play which seemed to be a big factor during the 1st half. 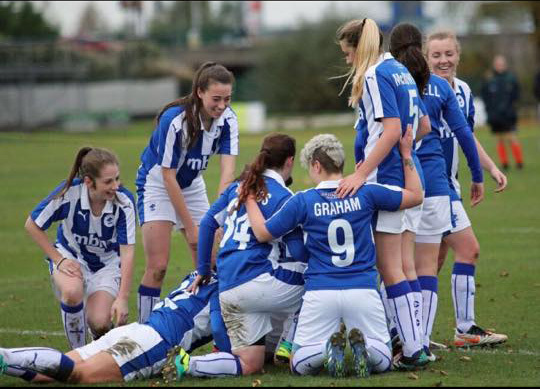 Some bold changes were made by the management with Phoebe Graham replacing top scorer Marcia Jones-Sacharewicz and Katy Beattie replacing Captain Steph Oscroft. The 2nd half started similar to the 1st, with both teams still trying to work each other out. Charlotte Dunbebin had to be alert early on saving well from a Runcorn chance who themselves began to grow into the game after making a number of substitutions. However as the 2nd half went on we improved and Phoebe Graham was showing great energy pressing high up the pitch and was excellently supported just behind by Amy Whittle. This resulted in Runcorn making more mistakes and our midfield having more possession. Phoebe Graham had an excellent chance on 57 minutes, after receiving the ball from Katy Beattie before dropping her shoulder and turning the centre back before racing through one vs one against the keeper, the chance was rushed and put wide when really it should have been a goal. Minutes later after a half cleared Runcorn corner resulted in a cross coming back into our box and a free header from their striker, which forced Charlotte Dunbebin into another wonder stop at point blank range to push the ball over the bar. The level of concentration she showed was of the highest order and this save really made a statement to her old team. The game looked to be heading for a 0-0 draw which would probably been a fair result until the 85th minute when a whipped in Sam Pickup corner towards the near post resulted in Lauren Stringer beating her marker and glancing a firm header towards goal that beat the Runcorn keeper and hitting the back of the net to give us the lead. It was Stringers 1st goal for the club and what a time to score it. We love late goals against Runcorn especially corners. You could tell from the celebrations what it meant to the players and it was great to see the management involved too. We managed to withstand a late Runcorn onslaught and see out the game and take all 3 points which in the end deserved for the team who tried to play football. We stay top of the league and know staying up there is in our own hands if we keep performing and winning games. It’s another clean sheet which makes 5 out of 9 games now which is so pleasing to see and shows that hard work in training really does pay off. It was also pleasing to get the winner from an area we targeted in our build up to the game. This game was a tale of 2 halves, we started very well and looked in total control and kept the ball very well. We raced into a 4-0 lead without even getting out of second gear and were a threat from every set piece. The first goal was scored by midfielder Becky Tebb on 5 minutes who rifled into the side netting of the goal from a half cleared corner, a fantastic finish which gave the goalkeeper absolutely no chance. Our 2nd goal on 9 minutes was scored by Amy Whittle, a fine corner delivery resulted in Amy Whittle beating the keeper to the ball at the near post and heading into the roof of the net. Our 3rd of the afternoon on 24 minutes was again from a corner and another Sam Pickup delivery, Sarah Redman who had gone close twice previously, beat her marker before thumping an unstoppable header beyond the keeper. The 4th of the afternoon was this time scored by creator in chief Sam Pickup, racing through onto a defence splitting pass from centre back Hannah Collins before dinking over the keeper on 36 minutes. Right on half time a reckless challenge in our penalty area resulted in Witton pulling a goal back against the run of play from the penalty spot, Charlotte Dunbebin desperately unlucky not to save it with her legs. Changes were made at half time due to injuries and to take a look at some fringe players and normal service was resumed with Phoebe Graham who was now playing on the left hand of midfield racing onto a Jamie McDowell through ball and chipping the oncoming keeper on 60 minutes. Amy Whittle grabbed her 2nd of the game with another thumping header from another fine Sam Pickup corner delivery in the 69th minute. We did concede 2 late goals which made the score look more respectable for Witton from what were 2 mistakes, which we are disappointed with. Their Captain Danielle Lydiate driving through and firing home from 20 yards and their striker capitalising on a mistake and placing past Charlotte Dunbebin. Overall it was a job done against tricky opponents and we took the 3 points, with Crewe dropping points again and our superior goal difference we remain top of the league with remaining there firmly in our own hands. 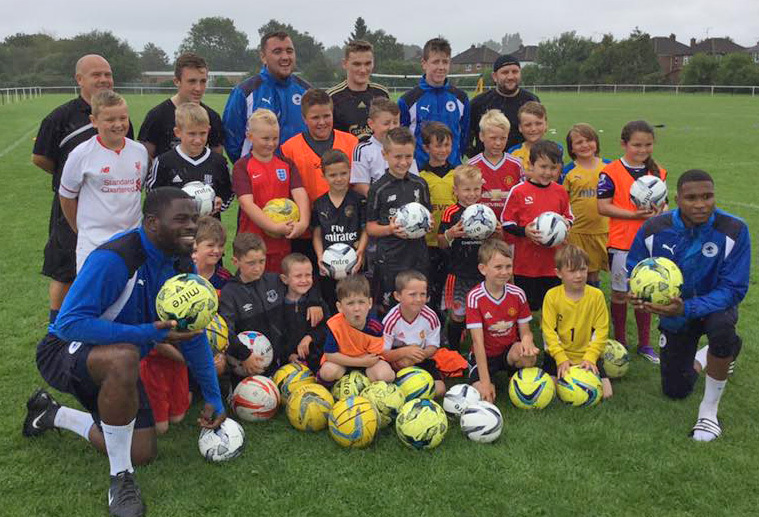 James Alabi and Kane Richards visited Blacon Youth Club to donate some footballs after a recent break-in at the club. 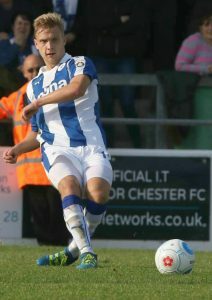 Tom Crawford, who played for the club as a youngster, attended too and joined in games with children attending a soccer school. Grassroots clubs like Blacon have a fantastic impact on our communities and we are delighted to support them.